Ukraine. 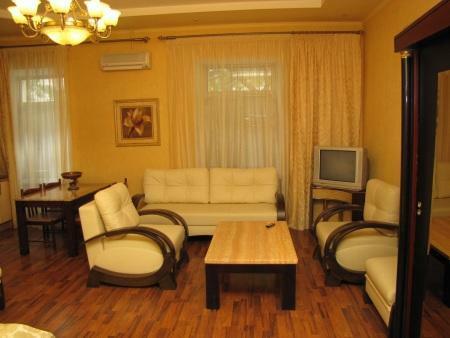 Odessa Hotels Reservation Service offers for clients to rent a flat in the centre of Odessa and near the sea. At this page You can choose the variant of the flat which suits you better from our catalogue by filling in the enquiry form. We shall do everything possible to provide you with more comfortable and cheaper accommodation than in the hotel. The flats we are glad to offer you contain all the necessary things, which all of us got used to, they are: TV-set, refrigerator, washing machine, iron, telephone, well-equipped kitchen, broad bed and many other comfortable things. How to write an enquiry? You can write the enquiry by filling in special form, which you may find by using the reference on the chosen flat page, or you may contact us by E-mail: zakaz@odecca.ru, phone/fax in Odessa +38 (048) 728-80-20 and you will receive the acknowledgement concerning the possibility to rent the accommodation for the indicated by you dates during the day. How does the price depend upon the term of rent? The prices indicated in our site refer to the terms 4-10 days and more. 1-3 days will cost you approximately for 5-10 $ more. When is the flat considered to be the booked one? 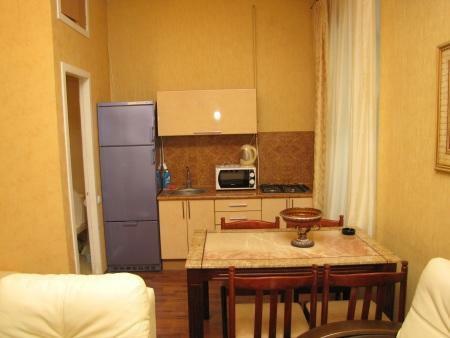 The flat is considered to be booked upon the receipt from you the prepayment for 2 days of living. The prepayment can be accomplished by your representative in Odessa or by means of WESTERN UNION - Money transfer service. You may also send us the advance by another suitable for you way. Up to what time is it better to book a flat ? 5-7 days earlier is usually enough. In summer it is better to fulfill the reservation 15-20 days earlier. How can the rent of a flat be accomplished? The historical city centre, Chaikovsky. The second floor of the old building. Next Opera, Potemkin staircase, UL. Deribasovskaya, cozy cafes and shops. A nice sea air. Windows overlook the world-famous Opera House, in the yard of the House are parking and one of the best fitness centres of Europe FORMULA. A comfortable apartment of the total area 49 m2, 2 double bed, modern sofa, beautiful lighting, kitchen Studio. The apartment is equipped with air conditioning, kettle, telephone, cable TV and high-speed Wi-Fi Internet. 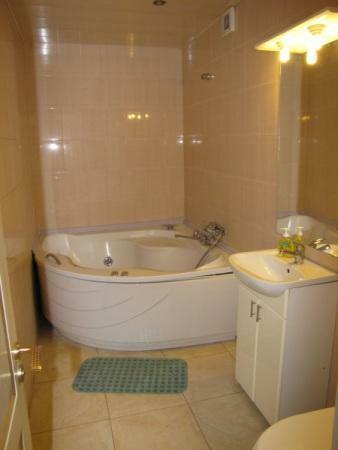 There is a large jacuzzi bath. * Reservation service is free of charge.